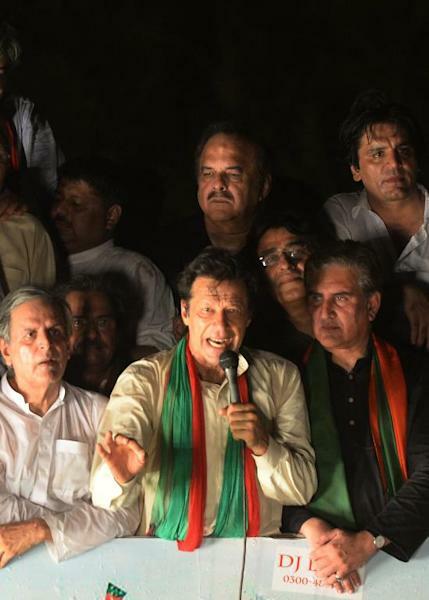 Thousands of protesters led in colourful, flag-waving convoys by cricketer-turned-politician Imran Khan and a populist cleric advanced on the Pakistani capital Friday in a bid to unseat the government they say was elected by fraud. Khan and preacher Tahir-ul-Qadri say the May 2013 general election that brought Prime Minister Nawaz Sharif to power in a landslide was rigged and are demanding he resign and hold new polls. They plan a mass rally in Islamabad to press their claims, at the end of a "long march" -- in reality a motorised cavalcade -- which began from the eastern city of Lahore, around 300 kilometres (190 miles) away, on Thursday. By late Friday morning Khan's march had reached the garrison and industrial city of Gujranwala around 70 kilometres north of Lahore. 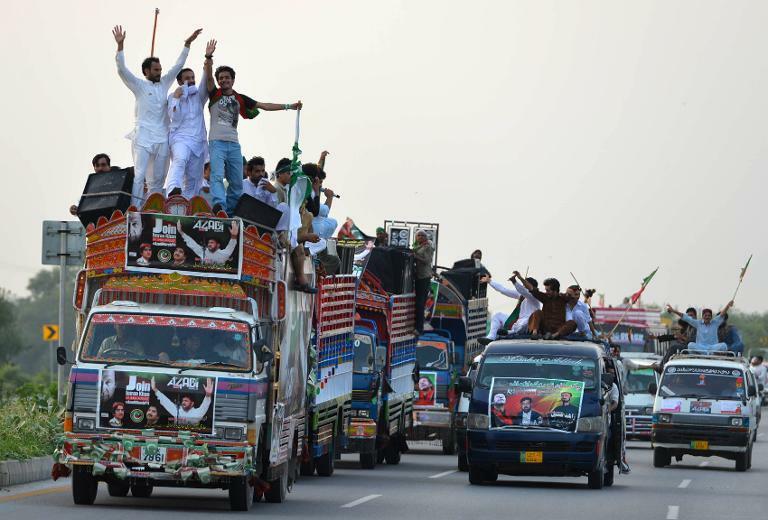 Supporters of Khan's Pakistan Tehreek-e-Insaaf (PTI) party, which came third in last year's election, lined up to welcome the convoy in towns along the Grand Trunk Road which links Lahore and Islamabad. Activists waved green and red PTI flags, danced and sang patriotic songs to greet the march, an AFP photographer said. Exact numbers on the march were difficult to judge, and more people are likely to join it as it passes through towns along the GT Road, but Khan already hailed it a success. "I can only see that the monarchy is nearing its end," Khan said, referring to Sharif. "The people have decided as I had said that one million people will come to Islamabad and they have come out." Both Khan and Qadri had originally planned for their marches to converge on Islamabad on Thursday, Pakistan's independence day, but it now looks likely that neither will reach the city before late on Friday afternoon. A spokesman for Qadri, the head of his own Pakistan Awami Tehreek (PAT) movement, told AFP that their convoy was further along the road to Islamabad than PTI, in the town of Jhelum, some 120 kilometres south of Islamabad. "Our convoy is moving at a very slow pace and we expect our arrival in Islamabad very late tonight," he said. Security in Islamabad has been ramped up in recent days, with more than 20,000 police and security forces on the streets. Almost all roads into the city were blocked on Thursday by the authorities with barbed wire and shipping containers, but many barriers were removed on Friday. 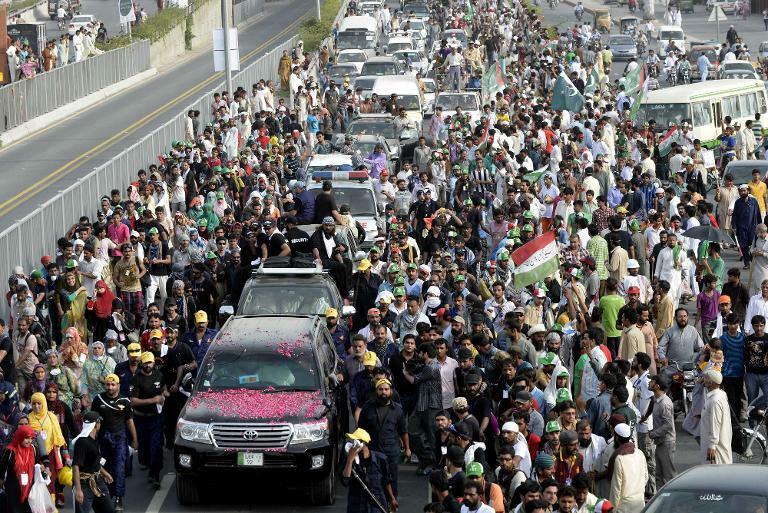 After days of speculation that the authorities would seek to stop marchers entering the city, Interior Minister Chaudhry Nisar Ali Khan told reporters Thursday that both PTI and PAT would be allowed to hold rallies. Government officials have accused the march organisers of trying to derail democracy and Sharif said the marches were a distraction from more pressing issues. Pakistan is currently waging a military offensive against Taliban hideouts in its northwest, while also trying to boost a sagging economy and solve a chronic power supply crisis. Highlighting the fragile security situation, late on Thursday militants attacked two airbases in the southwestern city of Quetta, with eight attackers killed by security forces.